Comares Malaga - Information. Getting from Malaga airport to Comares. This municipality in the province of Malaga is situated about 24 kilometres away from Velez-Malaga, at the foothills of the Malaga mountains. 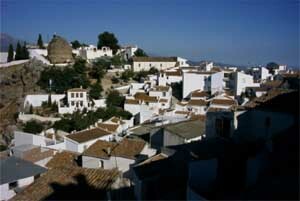 This white village was originally Muslim and it stands out for the traces of its Arabic past and its medieval period. Comares was founded by the Arabs who named it “Hins-Qomarix”, which means “Castle of height”. There have been found remains of roman presence, although its traces of having passed through Comares have gradually disappeared over the passage of the centuries. What did endure however is the Arabic style in the enlargement of the houses outside the castle up the mountainside. The only thing left of the Comares castle are the remains of one of its walls and two of its towers, although in the past it was the defensive epicentre of the surrounding municipalities and the bastion in the defence against the invasion of the Christian troops, who finally invaded the city on the 29th of April 1487, on the day the surrender of Comares took place. After the conquest of Comares, 30 Muslim families who decided to become Christians were baptised in the street that is known today as ‘calle del perdon’ (forgiveness street), although later on the continuously increasing demands towards the Moors, would cause these to leave the peninsula and head to the north of Africa. Comares is also part of the history of the famous Andalusian bandits, as it was in fact the birthplace of some of those bandits who travelled around from one village to another during the 19th century looking to mug anyone on these paths, or defending the area from the Napoleonic invasion. The whole village of Comares is worth visiting, its narrow streets that meander upwards, where each step we take, transports us to the past, to when the fortress was built that originally dominated the scenery and that today all that’s left are two towers that reinforced the wall. In the oldest street we’ll come across arches from the medieval period. 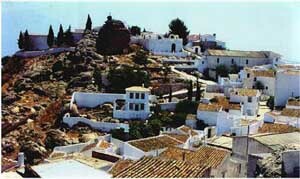 Apart from the several Arab remains that are worth visiting, the village has religious buildings that were built as from the Christian invasion like the Encarnacion parish church, which is located right at the top and has 16th century Moorish style. Originally Arab and was declared National Historical Monument in 1931. If we wander into the streets of Comares we’ll be able to observe in its oldest streets, two arches most likely preserved from the medieval period. Remains of the Comares castle’s wall, from the Muslim period and was originally a huge fortress. This name was given to a small tower that, back in the day, was part of the Comares castle. Here we’ll find the remains of a city that dates back to the 9th and 10th century. In this place they have found pieces of ceramics and even skeletons. 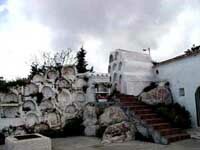 Although its origin is unknown, los verdiales has parts of ancient Arab romances, root and origin of flamenco singing. They have even found mosaics in Pompeii where the same instruments appeared, which is why the origin of this dance and of this festivity probably dates back beyond ancient times. Considered one of the most important popular festivities in the area and is held on the third weekend of July. In this fair we’ll be able to enjoy the popular culture and verdiales in the municipality’s style. The fair of Comares starts on a Thursday and on that same day they organise all kinds of activities. The last day of the fair is on the following Sunday and the fireworks wrap it all up until the following year. During this fair they organise plenty of activities and they choose a queen of the festivity and her maids of honour. This fair begins on the second Friday of August with the setting off of fireworks. Throughout this fair they organise live music and numerous activities for the whole family. Religious festivity celebrated every 16th of January where they make a massive paella at 2pm for everyone to taste, with the municipality’s traditional verdiales. You can reach Comares in just about an hour from Malaga if you have your own vehicle (if you don’t have a vehicle you can hire a car at Malaga airport or at the Maria Zambrano train station). It’s a journey of about 50 kilometres from Malaga to Comares and on the map below you’ll see the route that we have selected. Following the Mediterranean motorway and turning off to take the route towards Olías, from where we’ll have to continue until we reach Comares. Official website: Ayuntamiento de Comares.